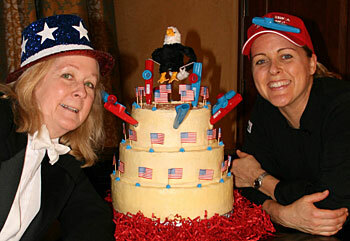 Barbara Stewart, Kazooby (Eagle) and Chef Whitney Stewart, with Joyful Noise National Kazoo Day Cake. Send your kazoo news and comments. Send news and comments to info@howtokazoo.com. 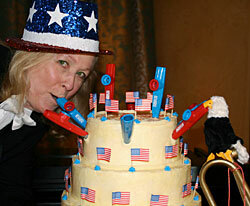 National Kazoo Day Was Jan 28, 2009! My name is Joanne and I am involved with a Jazz Band from the UK called The Harmonelles, the main instrument we play is the Kazoo, although this is a diffferent shape to the american version as it is more of a trumpet shape. This type of band has been around since the 1920's and was most popular in mining communities, the name jazz band came from the jazzy costumes they used to wear. What a fun group! 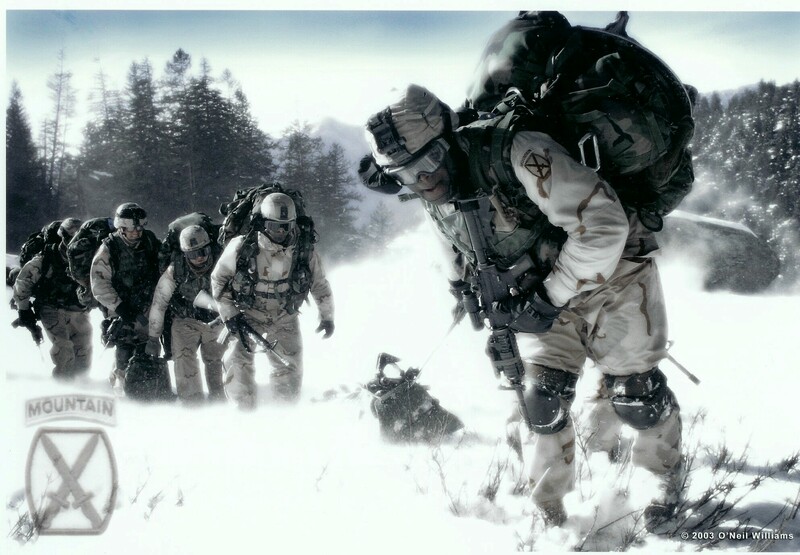 I love your precision drills. Be sure and pick up a copy of The Complete How to Kazoo to inspire new ideas for marching band formations! Incidentally, the trumpet-shaped instruments you are playing are very high quality, made in the UK by Newcastle Drum. I have one myself, and luxuriate in the sound. These high-end mirlitons are a variation on the kazoo, with a double resonator. In the late 1800s in the US this version was called a “zobo”. That instrument, while voice activated with a stretched membrane, has a double resonator and a stainless steel bell. This gives it a much clearer quality, more closely resembling a true brass instrument. The true kazoo is, of course, an American instrument, with a much fuzzier sound, beloved by generations of kazooists. True kazoos are distinguished from other varieties of similar instruments of the mirliton family by the turret on top. The turret acts musically as a collection device for the “antagonistic vibrations”, giving it the unique fuzzy quality, as well as a distinctive “submarine shape”. Ginger the Cat kazooing her famous meow sound. Yes! We heard it!!! Here is a favorite with discerning Kazoodaphiles - the Porwizorka Jazz Band. There are recordings available through the link www.zendotavern.com and there will be more information soon through that site. Check it out! 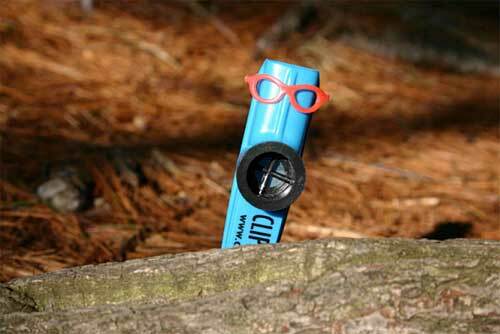 National Kazoo Day Is January 28, 2009!! National Kazoo Day occurs annually (although in some regions, more often) on or about January 28 - or whenever convenient for the kazooist. As stated by founder Chaplain Willard Rahn of the Joyful Noise Kazoo Band at the Homewood Retirement Home in Williamsport, Maryland, "After all, we have to be flexible." Many kazooists choose the fourth Thursday in January because it's handy. In 1983, while browsing through Readers Digest, Chaplain Rahn saw a note on National Tuba Day. If tubas, why not kazoos? Chaplain Rahn and the Joyful Noise Kazoo Band decided to DO something and establish National Kazoo Day. Unfortunately the oldest kazoo band in the world (average age 88.6666) initially had some difficulty making their voices heard. They were wisely referred by "How To Kazoo" author Barbara Stewart to the Associated Press , which had no hearing problem whatsoever - and the rest is kazoo history. Led in their campaign by Chaplain Willard Rahn, the Joyful Noise Kazoo Band marched triumphantly though red tape, as National Kazoo Day was officially established on or about the fourth Thursday in January. 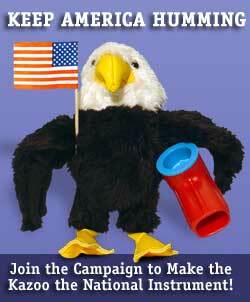 Ask not what you can kazoo for your country! Unfortunately, Chase’s Calendar (McGraw Hill) no longer lists National Kazoo Day, so word is passed on by oral tradition. It lives on in the hearts and minds of all loyal kazooists, who hand down the culture to future generations. Information Taken From "The Complete How To Kazoo" by Barbara Stewart. 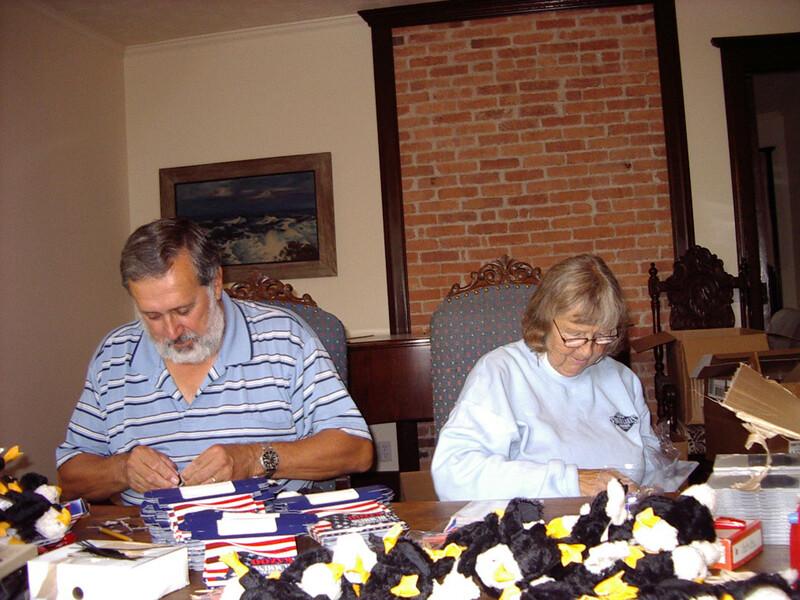 Share Arts recruit John Marsh, watchmaker/machinist & decorated WW II veteran, 10th Mountain Division (bronze star from campaign in Italy) - assembling Stealth Kazoos in the Share Arts production line (dining room table). Combat Kazooing! 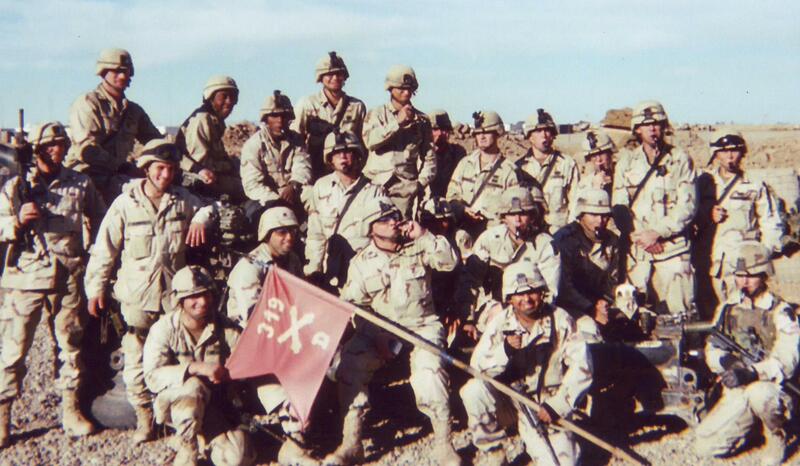 Here is the 173rd Army Airborne kazooing in Iraq in 2004. See the Combat Kazoo Report on page 176 of The Complete How to Kazoo Book, when it is issued by Workman Publishing in August 2006. Watch all the latest adventures of Mr. Kazoo at www.clipsandquips.com. The brainchild of film and TV producer Boaz Frankel, the site also has fun interviews with celebrities enticed into kazooing on camera. 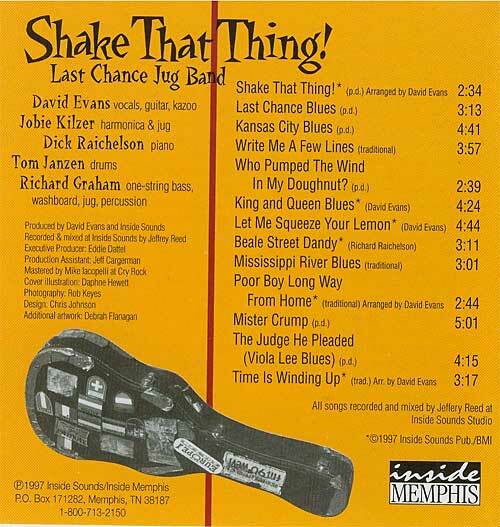 Want to find Rick Hubbard’s Kazoo Tour schedule? Need more kazoo news? Check out the Kazoobie, Inc site at www.kazoos.com for dates, events, products and everything kazoo. 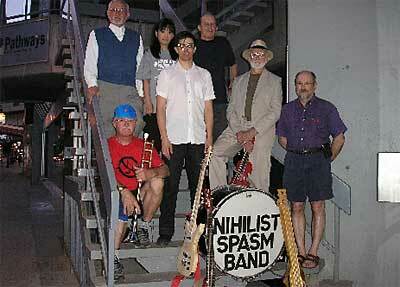 Here’s my favorite band without music, The Nihilist Spasm Band from London, Ontario CANADA. It’s the oldest continuously operating noise band around. They have mixed disorganized sound, combining kazoos, homemade and plugged-in instruments since the 1960s. Download this letter, fill in the blanks and send to your elected officials.